Valentina Shevchenko is the former Lightweight Kickboxing and Muay Thai champion of the world, and a former UFC Female Bantamweight division runner-up. She currently competes in UFC Flyweight division. Valentina Shevchenko is currently 31 years old according to her date of birth March 7, 1988. Valentina is one of the most attractive female fighters in the world of mixed martial arts. Her strongest weapons are left spinning back kick to the body, left spinning heel kick, right cross, and a left spinning back fist. Her Muay Thai clinch is fantastic. The Bullet is also recognized as the master of counter striking. Her favorite boxing combo is right jab-left cross. Her most often Judo move is kubi nage (neck throw). Valentina is a 2nd black belt in Taekwondo, International Master Of Sports in Muay Thai, and a Master Of Sports in Kickboxing and Boxing. She is also a black belt and Master Of Sports in Judo. During her kickboxing career, she defeated Joanna Jedrzejczyk three times. One more interesting fact – whenever she moves her leading leg to the left, it means she prepares for a lightning-fast counter strike! On the ground, Valentina has excellent submission offense. Her favorite submissions are rear naked choke (4 victories), armbar (2 victories), and Ezekiel choke (1 victory). She tries to keep the fight standing as long as possible. The Bullet has never been knocked out in the MMA fight! Valentina joined UFC with the tremendous kickboxing record of 56-2. However, she had only 4 knockout victories! She is also one of the youngest MMA competitors ever. She had her first MMA fight when she was only 15 years old! She has a nickname “Bullet” for a reason – she is fast as lighting and chances of evading her attack are reduced to a minimum. However, it comes from her twelfth year, when she knocked out a 22-year-old opponent in a kickboxing match in Kyrgyzstan. This fact makes her one of the youngest kickboxers ever. Her coach Pavel Fedotov gave her the nickname due to her world-class movement. Valentina Shevchenko had her MMA debut on April 21, 2003, at Kyrgyz Federation of Kulatuu, versus Eliza Aidaralieva. Despite she was only 15 years and 45 days old, she defeated her opponent via stunning TKO! The Bullet had the fastest victory of her career versus Priscila Orellana, whom she defeated after only 0:50 in the first round via TKO. She was defeated by Liz Carmouche via doctor stoppage in the smaller promotions, and she earned a notable victory over Jan Finney. 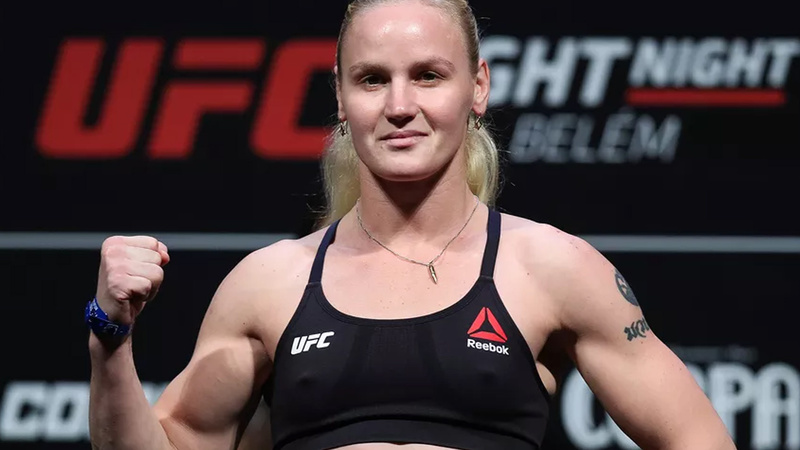 Valentina Shevchenko joined the UFC with the score of 10-1. Valentina Shevchenko had her UFC debut versus Sarah Kaufman at UFC On Fox 17, on December 19, 2015, in Orlando, Florida. She won the fight via unanimous decision. In her second fight, she faced Amanda Nunes, on March 5, 2016, at UFC 196. Despite she won the third round, she paid the price due to her slow start. The Lioness won via unanimous decision. This fight is also known as probably the best stand-up showdown in the history of the UFC Female Bantamweight division. The clash of two experienced strikers was extremely interesting to watch. The two faced at UFC On Fox 20, on July 23, 2016, in the main event of the evening. Despite The Bullet lost the first round, she recovered and demonstrated the power of elite counter striker. She even landed a left spinning heel kick that rocked Holly Holm, and multiple tremendous right crosses, spinning back fists and spinning back kicks. Valentina won the fight via unanimous decision. Her next rival was Julianna Pena at UFC On Fox 23, on January 28, 2017, in the main event of the evening. The Bullet won the fight via armbar in the second round, earning her first Performance Of The Night award. Their match should occur at UFC 213, but Amanda Nunes felt ill and pulled back on the day of the fight, despite the doctors gave her green light. The two faced again in the main event of UFC 215, on September 9, 2017, in Edmonton, Alberta. 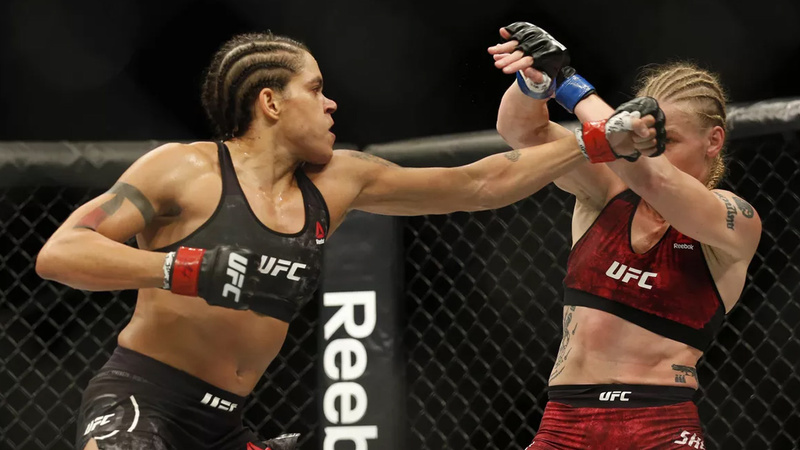 It was a very close back-and-forth fight, and Amanda Nunes won via split decision. The Bullet didn’t agree with judges’ scorecards but stated she respects the final outcome. When it comes to media outlets, 10 scored the fight for Nunes, 10 for Shevchenko, and 2 scored it a draw. Valentina Shevchenko moved to Flyweight division after this loss. It was one of the most controversial fights since many spectators believe that the referee Mario Yamasaki should stop the fight much earlier. Yamasaki claimed that he gave Priscila the chance to “fight like a warrior”. Joe Rogan and Dana White were very critical towards the veteran referee. The two faced at UFC Fight Night 125, on February 3, 2018. Shevchenko scored an early takedown in the first round and started landing big punches and elbows from the top. She did the same thing in the second. Valentina ended the fight via rear-naked choke in the dominant position, outstriking her opponent with the score of 230-3, and earning her second Performance Of The Night award. 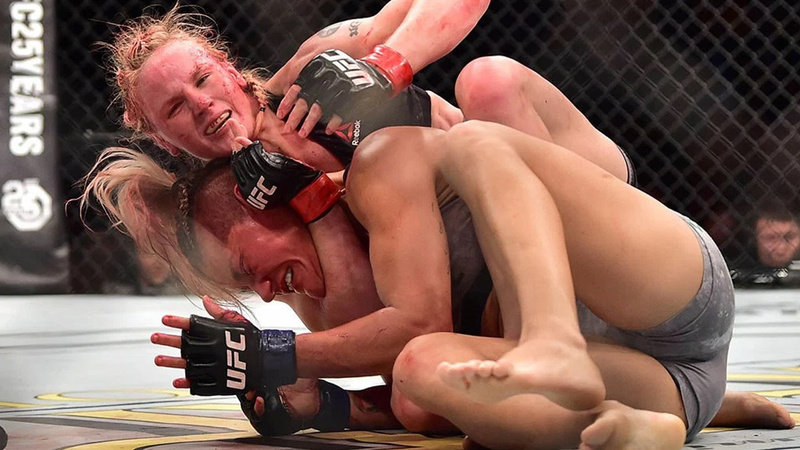 She earned the second place in the history of UFC for the most significant strikes landed in a single fight – 230. The Bullet is scheduled to face UFC Flyweight Champion Nicco Montano but the current date is unknown yet. The Bullet is a very tough woman. She survived the shootout during an armed robbery at a restaurant in Peru on May 23, 2016. Her coach Pavel Fedotov was injured when he fired back to the robbers. Valentina Shevchenko is single. She has a sister, Antonina Shevchenko, who is also a fighter. Both of them are excellent dancers. She currently lives in Lima, Peru.